The City of Boca Raton is the southernmost city in Palm Beach County, Florida. With an estimated population of 98,150, it is one of the wealthiest communities in South Florida. There are more than 2,000 full-time and part-time employees that provide various services through seven departments. The City was looking to replace its ticketing system to make Employee Onboarding and other processes for handling service requests across all departments highly efficient. The on-boarding process consisted of numerous steps requiring the creation of multiple tickets per new employee and technicians would have to create tickets for other IT staff members to perform their tasks. Many processes were manual and needed to be automated. The City of Boca Raton replaced its ageing ticketing and asset management solution with BOSSDesk Service Management on the Cloud to get a better handle on their assets and also to improve their service delivery. They automated their complex employee Onboarding with workflows and approvals using the BOSSDesk Service Catalog. They also used the Service Catalog for handling service requests for all other departments. The implementation process started with a detailed analysis of the current On Boarding processes to understand what applications were used, who installed, supported, created user accounts and assigned permissions to these applications. The role of Human Resources and the Hiring Manager was clearly defined as well as the permissions required for requesting hardware and software for new employees. Service requests would be generated by both HR and the hiring manager and some manual steps would need to be automated to improve efficiency. "I developed a list of the applications we supported, and the different locations we supported.Then I developed a list of who installed, supported, and created accounts/permissions for those applications. Once that process was complete, I began creating the Teams. During this process, it was quite clear that the most complex process was the On Boarding process.This process involved many people, in and outside of IT. The one important element I needed to consider when creating these tasks was the order in which the tasks were created. I wanted to be able to allow the technicians to “at a glance” see if the prerequisite tasks had been completed. Therefore, you need to be cognizant of the order of your routing rules. I limited visibility of the New Employee Request form to the HR Division to prevent others from being able to make requests for new employees. For other departments like the Police, the requirements are different, so I created a New Employee Request form for Police. However, I did incorporate the software portion on that Service Catalog Item as the requester from Police Services would know what software the new employee would require. Again, I limited visibility of this Service Catalog Item to Police by the use of Active Directory Groups"
The global consulting company Pink Elephant has determined that 2018 is the “Year of Integrated Service Management” and highlighted the opportunity for real synergy between best practices, well configured tools and properly organized and motivated people. BOSS Solutions agrees with this direction. Our company specializes in integrated service management solutions, incorporates best practices, and provides customers the best level of support to achieve business value. Forward thinking IT organizations have adopted this strategy to provide their clients with an exceptional level of service and process improvements. If your IT organization is struggling with fragmented insights, silos of automation or broken processes , Integrated Service Management solutions can help address these issues across the entire organization. One way that this can be easily accomplished is by creating service catalogs that are integrated with other system resources. Services and requests can be automated and offered selectively from a single portal and no coding skills are needed to construct workflows; be they simple or complex. Service Catalogs can be integrated with routing rules, calendars, schedulers and other available resources to provide users with improved workflows. Many IT organizations provide their client departments with process improvements across a wide range of applications from providing Onboarding applications for Human Resources to simplifying Equipment Return requests for Operations, and scheduling Facility Requests for Public Service departments. These enhancements have generated proven results for the client organizations by reducing the time and cost of delivering services while greatly improving the user experience. 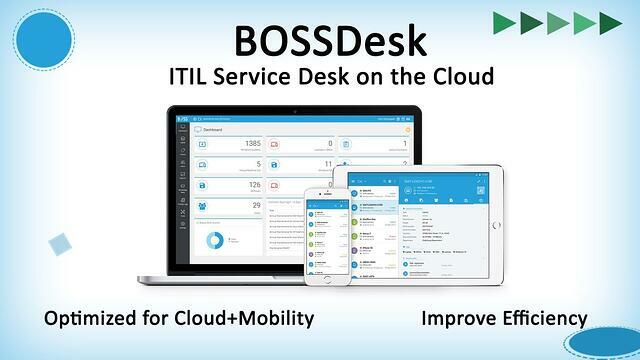 BOSS Solutions offers such integrated service management capability with BOSSDesk an ITIL Service Desk on the cloud. 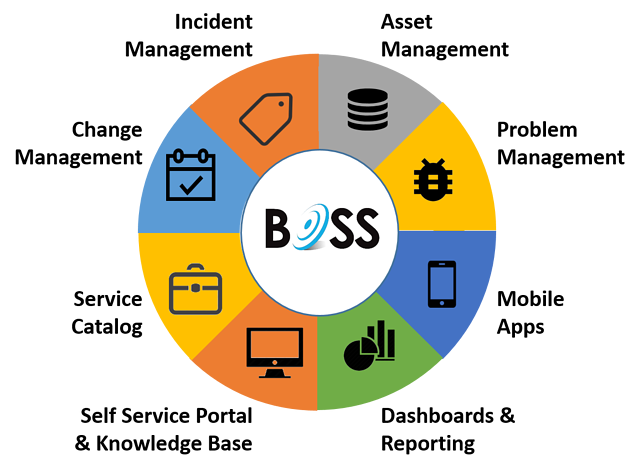 Following a comprehensive Beta Trial program BOSS Solutions announced the General Availability of the new BOSS Support Central which takes on-premise IT Service Management to a new level and allows organizations to manage, track and keep control of their IT environment. The product is designed to ITIL standards, incorporates advanced capabilities, has an award winning user-friendly interface, and is closely aligned with BOSSDesk the company’s Service Desk on the cloud. 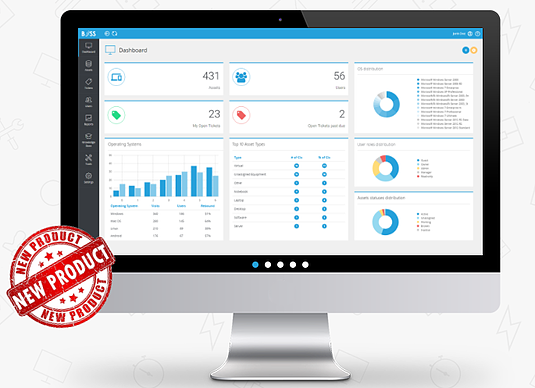 The product has undergone a major upgrade to incorporate the latest technologies and major capabilities include advanced Help Desk Ticket Management and complete Asset Management capability. Reporting capabilities include a comprehensive array of standard reports and charts. The self-service web portal is easy to use and when combined with the Knowledge Base and Custom Forms can significantly improve efficiency of IT service delivery. Customizable widgets allow Dashboards to be modified to meet the need of all technicians using the system, and Mobile apps for iOS and Android allow for remote access. In the modern era, the Service Catalog has redefined the way services are offered and delivered within an organization. The Service Catalog provides an easy means to improve operational efficiency and help keep service delivery costs low. All service offerings are delivered and managed using a single portal and this dramatically improves service delivery and user satisfaction. An ITIL based Service Catalog offers the ability to manage critical information in a central repository accessible by both the IT department and the business. The information contained within the Service Catalog relates to all Services provided by the IT department to the Business. The Service Catalog can be applied across all platforms, environments or geographical locations of any organization. ITIL V3 standards advocate service catalogs as a best practice requirement for service management. Service Catalogs offer a customer facing view of all the service and product offerings for all the departments within an organization. They enable organizations to promote these offerings in a structured and easily navigable manner. A user friendly service catalog encourages and enhances customer self service .It allows you to empower your customers with Self-Service. A well thought out and managed service catalog provides a great self-service opportunity for customers. 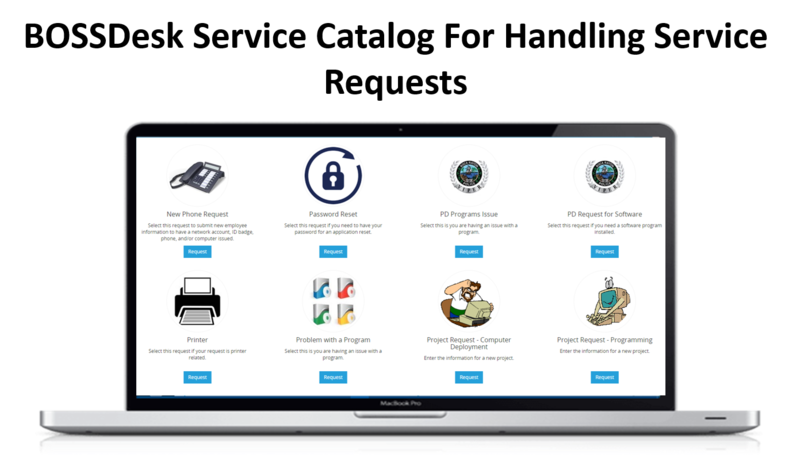 It offers a single portal to present all service and product offerings of the organization and a standardized approach to complete all requests . Services and requests can be offered selectively and efficiently from one portal. It allows customer expectations to be managed to ensure high levels of customer satisfaction. The first step in developing an IT service catalog for an organization is to put together an inventory of all the services critical to the business. This includes incorporating services beyond IT like Employee Onboarding or Citizens Portals . A flow chart or documentation outlining current manual processes will help define how to automate various processes for effective service delivery. Other critical elements in defining the Service process like the number of players involved in the process ,the mutiple steps required in the completion of the task, listing the hierarchcy and people to be notifed on task completion are all essential to put together a catalog for each process. Once the catalog is created it needs to be managed through its lifecycle. Workflow and automation processes need to be incorporated for effective service delivery. Routing Rules are extremely important and are at the heart of the workflow process. The order of the routing rules is important to allow the technicians to view, at a glance, when they should be performing their tasks. Use of tags, folders and workflows to organize, prioritize and route conversations will help ensure appropriate, timely follow-up. Winter Park is a suburban city in Orange County, Florida, United States. Winter Park was founded as a resort community in the late 19th and early 20th centuries. Located just three miles north of Orlando , the city is nine-square miles with over 28,000 residents. Winter Park is known for its Old World charm, elegant homes, quaint bricked streets, first-class shopping and dining experiences. The City of Winter Park, FL has been streamlining interactions and transforming productivity not only in IT but in other areas like HR and Purchasing with the help of BOSSDesk, IT Service Management solution on the Cloud. The city moved from the TrackIT solution to BOSSDesk due to the need for a more intuitive, modern and user friendly solution. Implementing BOSSDesk has resulted in users engaging well and recording issues through the portal increasing accountability and efficiency. In addition to using the solution for managing incidents and requests, the IT department is also using BOSSDesk to manage the city assets (Cis). All the assets such as laptops, phones assigned to employees are tracked. This increases ROI through accountability and getting more utilization of the assets. This capability has been extended to other departments as well. The Purchasing Department processes all Purchase requests with the help of BOSSDesk. Automating Employee Onboarding and Offboarding through BOSSDesk service catalog, has resulted in tremendous savings of time and improved efficiency. Earlier, several exchange of emails were needed for completing simple tasks.This has now been replaced with one form that automates all the tasks with appropriate routing and approvals. All the information is tracked and the task gets completed in a timely manner. The use of Problem Management has helped identify and solve problems in a more organized way thereby avoiding recurrence of incidents. The automation associated with Problem management results in quick resolution of all incidents associated with a problem and users get updated and notified in a timely manner. Change Management has been put in place and has helped the city plan and implement changes in a more organized fashion. Better communication and automated approval processes has increased cooperation from stake holders and users. This ensures that the actions of the administrators does not affect any end users. The BOSSDesk Mobile app has benefitted the city in more ways than one. It is a big time saver as technicians can address issues on the go. The departments service multiple locations and technicians are out in the field a lot . The smart phone access is a time saver as it helps the techs resolve and update the tickets quickly and managers are able to monitor the tickets as needed.The availability of mobile app has improved efficiency and user satisfaction.